Why and how to grow your own healthy food? Click Google's new "+1" button if you like this page! From answering "Why grow healthy food? ", this page evoled into the guide for growing healthy food in the urban backyard the easiest possible way. There are step by step starter guides, reviews of the most popular methods of starting a vegetable garden, tips how to build garden boxes, lists of best vegetables to plant, plant care tips and more. If you have no interest in my ramblings about reasons to grow your own food, just scroll down and find links that interest you. 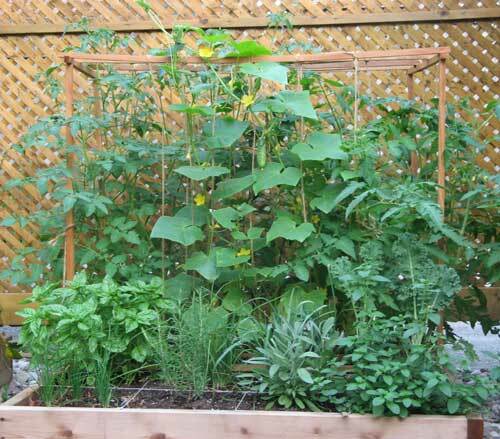 Save time and effort and discover the simplest and the most productive ways to grow healthy food on your own backyard. I am a very busy person who started seven years ago as an absolute beginner. 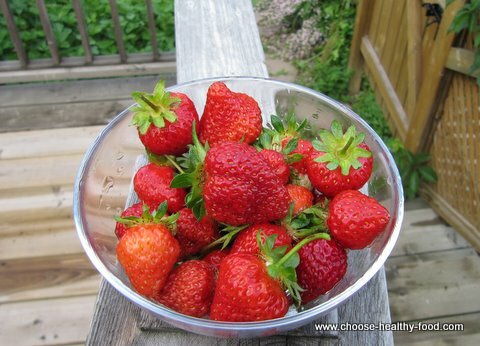 In my tiny Toronto backyard, I grow organic berries, veggies and herbs. I save money, enjoy my environment, and make my family's diet healthier. If I can do it, you can, too. When considering marriage, wise women look beyond the looks. We search for substance, those internal qualities that will make our partnership happy, healthy and beneficial. We want a person who would nurture our relationship. We recognize that quality comes from within. Have you thought that by putting food on your plate, you also get involved in the long-term relationship? What you choose to put into your body today will produce some long term effects. There is no neutral food. Short affairs with empty food will leave scars inside just like meaningless serial dating. Longer affairs with the bad boys may end up in an abused body filled with disease. It's important to choose the food with substance, food that gives, instead of taking away, our health. Plants extract nutrients from it and after a series of chemical reactions convert them into nutrients and phytochemicals that will nourish your wellbeing. Just like two people who may look similar, but one has more substance than the other, so plants may look the same but have a different amount of nutrients. You have no way of being sure what's inside your food unless you grow your own. I live in a house with a tiny backyard, yet I am able to grow my own herbs, vegetables and berries. In the middle of summer, the thick hot downtown air at the back of my house gets filled with bumble bees and butterflies. I produce so much food that I have to dry herbs for the winter. Growing healthy food is unbelievably fun! Your cooking becomes healthy, easy and versatile. Recipe calls for sage and tarragon? No need to go to the store. Your plants are available and free from toxins and pesticides. Your health improves. You may think that you eat more greens and improve your health, but greens contain a lot of pesticides. Your only healthy choices are to buy organic - or grow cheap healthy food by yourself. Growing your own healthy food is stress-relieving. Creating your own paradise in the small urban space is worth trying for this reason. You may worry that with high air and soil pollution levels in the city your garden cannot possibly produce healthy food. This is only partially true. Organic gardening research has proven that plants growing on the healthy rich soil build natural immune systems able to withstand attacks of pests (therefore, no need for pesticides) and toxins. So by growing your own food, you will ensure that nutrients are present and pesticides are absent. Research has also showed that such food is crucial to building your body's strong immune system – the system that will weather everyday toxin attacks, as well as reduce potential damage caused by them. For those who chose Ecological Gardening, protecting from pests is even easier. When the plants are mixed, as they are in this concept, their scents become mixed, too, and this confuses pests that prefer one particular plant. This way the plants protect each other naturally. Do not use antibiotic-filled and estrogen-rich manure based on human or animal waste, go for leaf or seaweed compost instead. So how do YOU grow healthy food? If you use a traditional way of growing your vegetable garden, check out Top vegetable garden tips. There are two innovative ways of growing an urban garden, that are easier and more efficient in the small urban space than traditional vegetable gardening. They are: Square foot gardening and Food4Wealth Ecological gardening. You can read my review and use my comparison table in order to decide, which one is better for you to use. Both methods allow to grow food in small urban garden with NO WEEDS. I have switched from SFG to the Food4Wealth concept due to its ease of maintenance. On this picture: Allowing plants to self-seed naturally instead of turning soil and planting again is the first step I took in switching from SFG to Food4Wealth system. All these plants grew from the last year seeds. This method requires that you install 4x4 ft raised beds, fill them with a special planting mix, and plant a different plant or two in each square foot. You would rotate your plants to ensure your soil replenishes, and you would water your plants individually to prevent weeds from taking over empty spaces. Start with planning and building raised beds. Get the ingredients for the planting mix. 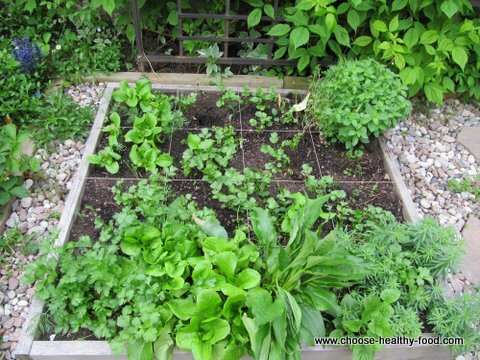 Select herbs and vegetables to plant in each square foot. Check out this very practical Guide for planning a vegetable garden and list of the best plants to grow. Use companion planting principle as your guideline so that your plants give the highest yield and protect each other from the pests naturally. Great and short advice from COG ( Canadian Organic growers) Toronto chapter can be found here: Companion Plants to Deter Pests, Protecting Plants Using other Plants. Learn about natural pest control products to protect your garden from pests naturally. Take control... And enjoy it! Growing your own healthy food is a personal act of taking matters of health into your own hands. No one in this world would care for your health if you don't. You bear the most responsibility – not your genes, your environment or your doctor. Growing your plants will enrich your diet, set up a foundation for fighting diseases, and reduce your stress level. Build your own paradise and stress relief spa in your own backyard. If I could do it, you can too. Enjoy! Watch your plants grow and collect the benefits. Explore my Healthy food recipes to make the most of your gardening experience. I continue posting pictures and articles for the 2013 planting season. If you want to learn more about practical square foot gardening and Food4Wealth, bookmark this page and come back for more.